What is the history of Astrology? Who first developed this concept and when? It is very difficult to say when the concept of astrology was developed in India. Vedas and Upanishads talk about the planetary movements and their impact on the human being. Many Rishis have contributed to this knowledge. 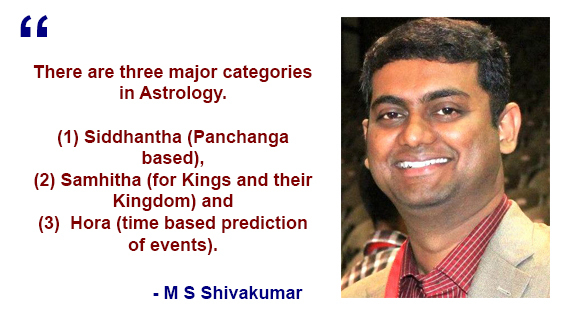 Even the Epics like Ramayana and Mahabaratha have references about astrology. Astrology dates back to 6000 to 10000 years. Vedic Astrology is also known as Jothisha. In ancient days, this knowledge was passed on to the disciples through Guru Parampara. It was not available to the common men, to prevent misuse of this concept. In those days, there were experts, who advised the kings while taking important decisions, based on astrology. There are three major categories in Astrology. (1) Siddhantha (Panchanga based), (2) Samhitha (for kings and their kingdoms) and (3) Hora (time-based prediction of events). Parasara Maharishi conducted a detailed study from the Vedas, Upanishads, Puranas and scriptures, written thousands of years ago. He filtered and consolidated the concept of astrology. Several schools of thought came up later. The Parasara school of thought is mainly followed. Jaimini, Saravali, Jathaka Parijatha, Saravartha Chinthamani were the main schools of thought that came up later. What is the basic concept of astrology? How is astronomy used in astrology? Planets and stars emit energy of different strengths at a variety of instances. These energy and its frequencies are the cause of the creation, sustenance and ending of events in one's life. Astrology involves 27 stars, 9 planets and 12 Bhavas (houses). To predict an event that can occur in future, we may need to analyse 2916 data points for accuracy (27 x 9 x 12), which will let us know the influence and impact of planets and stars on an event. If a person starts learning astrology at the age of 8, dedicating 8 hours per day for 800 years continuously, he will learn only one-sixteenth of astrology. It involves a lot of cosmic intelligence and calculation of planetary movement. There are three levels of consciousness – simple consciousness (5th sense), self consciousness (6th sense) and third cosmic consciousness (7th sense). Each consciousness can speak to each other. The planets in the universe communicate with each other through light, heat, rays, neutrinos, x-rays, etc. It has a huge impact on the human neural network. To understand cosmic consciousness, one needs cosmic intelligence. If you see the astrologers, they normally prepare two charts (Rasi and Navamsa), based on the date of birth, time and place. They are called Divisional Charts D1 and D9. These charts indicate the planetary positions at the time of birth of a person. We can make 144 such charts to understand deeply. The charts can be prepared from D1 to D144. There are three outcomes – event, experience and environment. Events are like occurrence of job, wedding, position, health, wealth, etc. Experience is emotions and feelings, derived out of an event. Environment is the boundary of the limitation within which a person's life operates. Potential and Manifestation are the two wheels of astrology. A person may have great knowledge about business or may be highly talented. The potential of the person can be so high that he can make things happen and can become rich. But in reality, if you check, he would not be able to produce success or achieve growth. That is called manifestation. One planet determines the skill and another planet determines the results. One may have the potential, but if not manifested in reality, it is of no use. In order to make use of the best time and increase the success rate, the branches of astrology like Kaala, Ganitha, Jaataka, Prasna, Murtha and Nimitta help. Vidhi, Madhi and Gadhi - Vidhi is fate, what is shown in the chart. Madhi can be utilised to escape Vidhi's difficulties or challenges. Gadhi is known as Surrender to Almighty. Bucke, a Canadian psychiatrist, says "cosmic consciousness is an interconnected way of seeing things, which is more of an intuitive knowing than it is a factual understanding. Astrology is not just a belief but knowledge about belief. It is like cautioning and helping a person to achieve maximum potential to manifestation. Astrology can never go wrong. An astrologer can go wrong. Is Astrology a Science or an Art? According to me, astrology is pure science. Today, astrology is seen as the 'Law of Possibility' rather than the 'Law of Accuracy'. 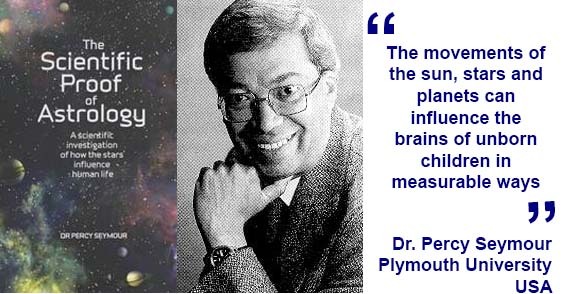 Dr. Percy Seymour conducted research on the Mechanism of Astrology in Plymouth University (USA). He concluded that planets move like tidal tugs; they interact with each other, and they have an impact on human lives. He also claimed in his book titled "The Scientific Proof of Astrology" that the movements of the sun, the stars and the planets can influence the brains of unborn children in measurable ways. Several researches on astrology have been initiated in various universities across the world. There are scientists who do not consider astrology as science. Everything need not be classified under science. I feel the opposite of science is not pseudo science, myth, spirituality or belief. I call it 'unexplored science'. Science and spiritual belief co-existed for ages. Even today, we see many scientists who believe in spirituality, culture and values. People who are rational are also spiritual. It is not either science or culture, rational or spiritual. It is a combination of both. By positioning ourselves on both sides, we may be able to understand the subject better. A single-sided perspective will only increase the blind spots. Proven science can only work within limited and restricted grounds. Studies are still being carried out in the unexplored areas of supernovae explosions, gamma ray bursts, and cosmic microwave background radiation. Although it consumes time, we need scholars to conduct more study to bring in evidence, logic and witness behind astrology and get the fullest benefit to mankind and take this subject to a larger audience for more fruitful findings. How Western Astrology Differs from Indian Astrology? Western astrology is sun sign-based. Indian astrology is moon-based. Vedic astrology is the oldest. All other schools of thoughts, whether Indian or Western, are derived from Vedic Astrology. Astrology is a wonderful science that provides guidance to maximise growth and success and minimise loss or distress. It helps you to be at right place at right time with the right people, with the right health and the right intention, guided by the right Guru or God Almighty. Make use of this science and be benefited!